Buying Park City Utah Real Estate; Shoulda, Coulda, Woulda??? Posted by Greg Harrigan on Friday, October 19th, 2012 at 1:34pm. Our team's philosophy is to help our clients understand the market here in Park City so that they can be successful in the purchase or sale of real estate in our area. We strive to educate, not pontificate, and we let our clients set their own timetable without pressure from us. The longer you wait to purchase a property in and around Park City the more you will pay. The real estate market in Park City has improved dramatically and that is evidenced by the activity we have seen the past few months; multiple offers, decreasing inventory and a significant reduction in distressed sales. Interest in Park City is shared by people in all parts of the country and many are in improving markets, but the mindset of many remains that it is a buyers market everywhere. The truth is that it is a buyers market until inventory starts falling and then the advantage changes to sellers. Park City is on the cusp of a return to a sellers market, and in some neighborhoods, sellers already have the advantage. 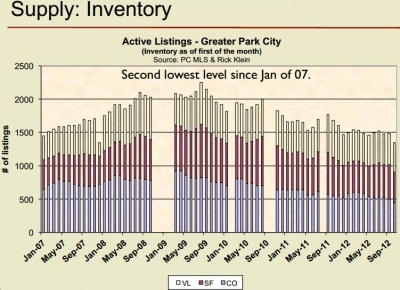 Inventory in the greater Park City area (homes, condos, and land) has fallen to its lowest level since early 2008, and the best options in price, condition and location are being sought by multiple parties. This increased competition for fewer choices is giving the advantage back to sellers. There is a ton of interest in bank owned and short sale properties, which has never been a huge amount of our inventory but this segment of the market is shrinking rapidly, and we see multiple offers and sales prices above list price on many of the distressed properties. 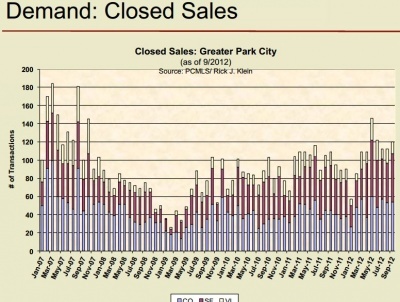 Demand is increasing and supply is significantly reduced for properties in and around Park City. 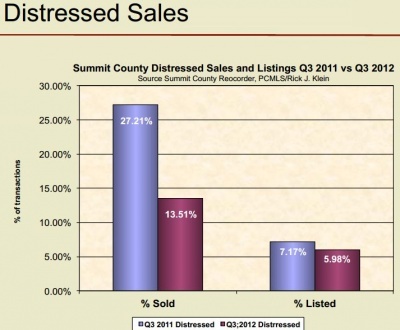 Distressed sales are declining, they now are at about 2007 levels. Prices have stabilised and will be appreciating in most areas as the market continues to improve. If you have been waiting for the right time to buy in Park City, wait no longer....call our team today for all the help you need to make the right decisions about Park City real estate.